We’ll be celebrating today and the rest of the year as Dr. Crispin has once again been recognized by Vitals.com! Vitals.com is a helpful resource used by patients who are trying to find the right doctor for their specific health needs. Each year, Vitals.com receives feedback and ratings from millions of patients’ about their doctors. Those who have been recognized are awarded for their exceptional service. Once again, Dr. Crispin has been recognized for two prestigious awards! 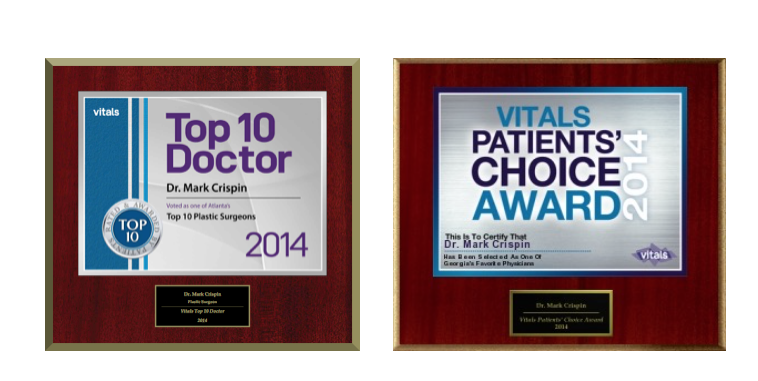 Dr. Crispin has been voted Atlanta’s Top 10 Plastic Surgeons as well as honored with 2014 Patients’ Choice Award. We would like to thank all of our amazing patients that have made these special awards possible. Our entire team is committed to bringing our patients personalized and attentive care. If you would like to learn more about Dr. Crispin’s work and his extensive cosmetic surgery background, contact us today.